Angaangaq Angakkorsuaq is a shaman, traditional healer, storyteller and carrier of the Qilaut (winddrum), whose family belongs to the traditional healers of the Far North from Kalaallit Nunaat, Greenland. His name means ‘The Man Who Looks Like His Uncle’. Since he was a child he was trained by his family- especially by his Grandmother Aanakasaa – for becoming a shaman. The spiritual task given by his mother is: “Melting the Ice in the Heart of Man”. Since a ceremony in Greenland 2009 where the “sacred fire” has been brought back to Greenland, he is carrying the title “Angakkorsuaq” – “Great Shaman”. Angaangaq bridges the boundaries of cultures and faiths in people young and old. His work has taken him to over 70 countries around the world. He conducts circles, seminars and Aalaartiviit – traditional sweat lodges. His teachings are deeply rooted in the wisdom of the oral healing traditions of his people, which enabled people over thousands of years to survive in one of the harshest places on Earth. 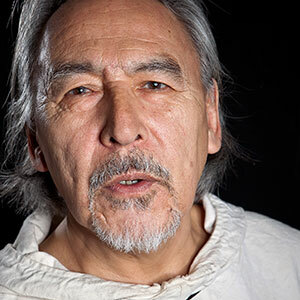 Angaangaq is a Keynote-Speaker at international conferences about climate change, environment, spiritual and indigenous issues.